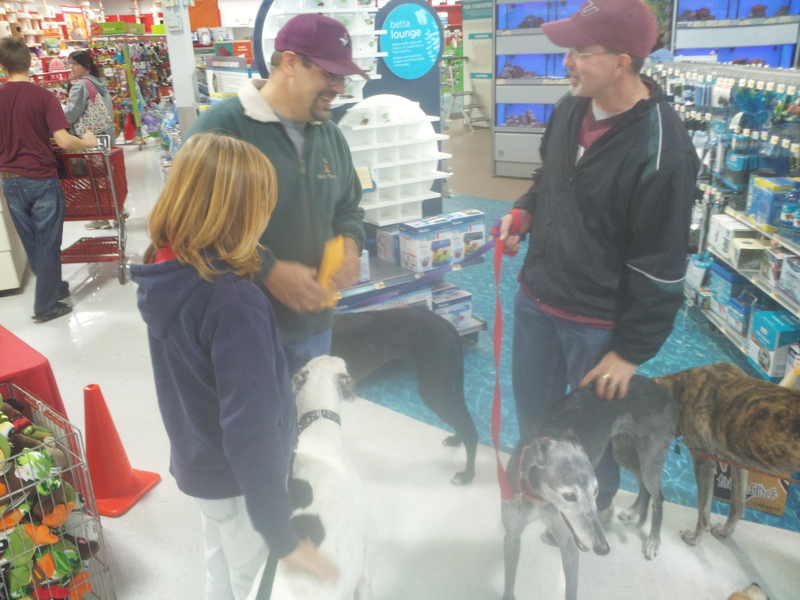 Posted in: Planet Greyhound, Rescued/Retired Greyhounds, Vladimir and Vitali. Tagged: Greyhound, Greyhound adoption, greyhound photos, Greyhound racing, sight hounds. 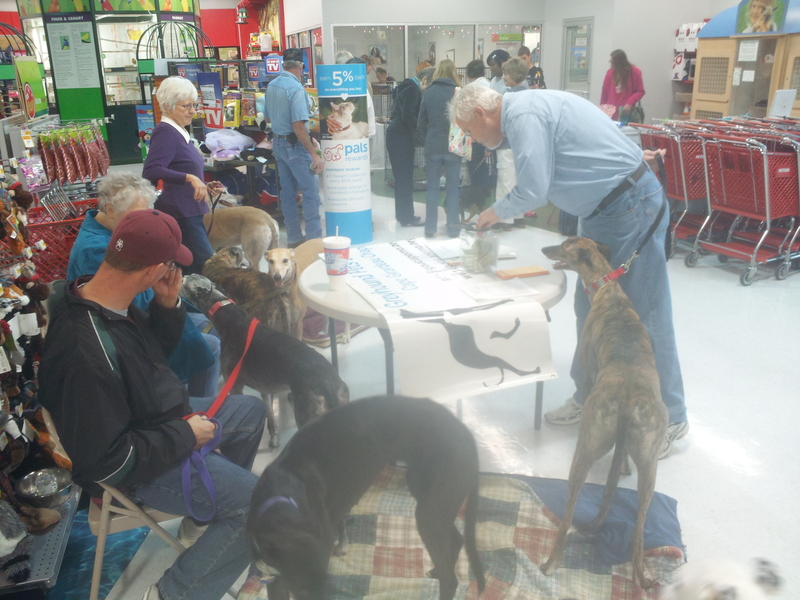 Once again doing their part to show people what great additions to a household ex racing greyhounds are, Planet Greyhound brothers, Vlad & Vitali participated in a “Trunk or Treat” in Cobden, Il. To many kids, they were just as much a treat as the candy being passed out, and many adults seemed to get a kick out of them also!. Our little group was made up of David & Cheryl Stewart, Fred & Paula Stearns, Tim & Kendall Waller, Steve & Cindy Pryor and of course the V-twins, Vladimir & Vitali. 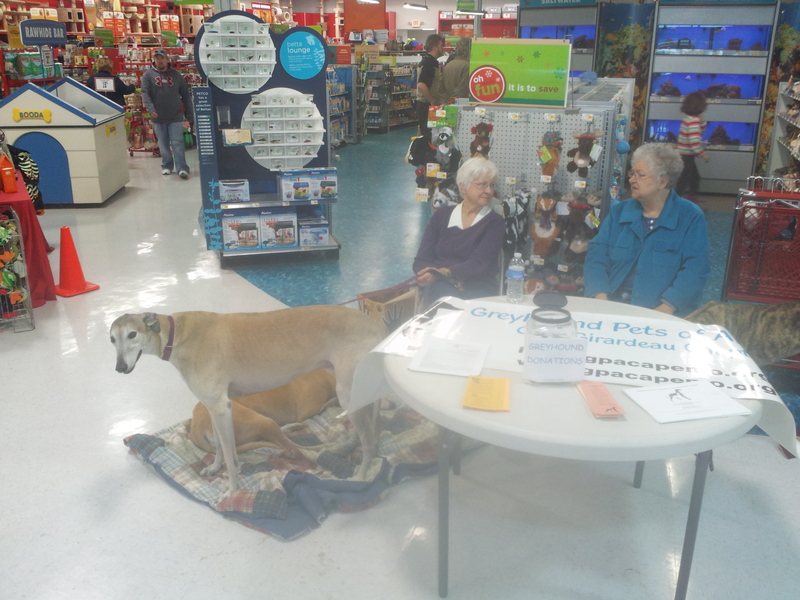 Posted in: anti racing, Greyhound abuse, greyhound racing facts, greyhound rescue, life of a racing greyhound, Planet Greyhound, truth about greyhound racing, young greyhounds. Tagged: greyhound abuse, greyhound breeders, greyhound puppies, Greyhound racing, greyhound racing kennel. Those races are Greyhound Races! At its very core, greyhound racing is controlled by gambling. It is big business, with total disregard for the dogs. However, the cruelty of this industry is being exposed more and more with each passing day. The majority of people attending these races are blind to what actually happens to these animals in their day to day life. Little do they know, or care, what kind of life these dogs lead. It is our job to inform them that the life of the racing Greyhound is one of misery, fear, mistreatment, and all too often, death at a young age. A few years back, the remains of approximately 3,000 Greyhounds from Florida tracks were discovered on the Alabama property of a track security guard who “took care” of unwanted dogs with a .22 rifle. Their horrible life began the day they were born, and ended the day they died. Some may say, you’re hashing up stuff from years ago…well, that may be true, but it still happened and it continues to happen, it is just that the people involved are being more careful about covering their tracks. It is believed that there are still, despite rescue groups best efforts, approximately 20,000 to 25,000 greyhounds destroyed each year. malnutrition, and dehydration. Any dog that slows down or becomes unprofitable stands a good chance of being killed. One kennel owner faced felony charges for selling over 1,000 such Greyhounds for “medical experimentation”. Greyhound breeders produce hundreds more animals than are needed. Any one of them that is lacking outstanding running ability stands a better than average chance of being killed. Remember, this is about money and gambling and a “non income producing” greyhound will not be tolerated. Few make it very far as racers, most ending up in a quick grave. The tracks in an effort to make more money have paid lobbyists to get legislatures to pass laws favoring gambling. Even if your state has banned Greyhound racing, it is likely that it has breeding kennels for supplying dogs to other states. Each year thousands of young Greyhounds who do not display potential to make money are “disposed of.” Some are sent to be killed at Veterinary offices, animal shelters, research labs, or any place that will finish them off quickly. Every year thousands of Greyhound puppies meet death allegedly from “natural causes” when in reality they are destroyed on the puppy farms. Very few of these pups are ever delivered to rescue groups. Many end up in a dumpster. Documented “disposal” methods include: euthanasia, mass euthanasia, gunshot, starvation, bludgeoning, donated for medical research, abandonment, sale to racing interest in third world countries, electrocution, hanging, and strangulation. In earlier years an ice pick shoved in the heart was a favorite method of disposal. Miami, at one time, used a decompression chamber to kill thousands. 1-13, with 7 being average. After being sent to training farms, traveling in cramped quarters, many dogs arrive at their final destination dead. Most are discarded after racing only a short time. Many Greyhounds that did not show potential for profit during training are killed before even having a chance to race at a track. The average greyhound racing kennel maintains around 60 to 80 dogs. Some “cheap” tracks often hold 200. An average track known as a “compound” with 15 kennels may house 1000 dogs. Living conditions at some tracks are disgustingly brutal, and an injury deemed to costly to treat can mean instant death. Why doesn’t the Government do something about the situation? Because Greyhound racing is a State mandated business. The Federal Government has no control over it. State regulations many times prove to be a conspiracy of silence…the old, hear no evil speak no evil. Everyone knows what is going on but few are willing to do anything about it. Even though some of the above mentioned is starting to recede because of more people getting involved in rescue groups and finding homes for more dogs, unfortunately either knowingly or unknowingly, many rescue groups themselves perpetuate this cycle of abuse because their parent organizations are in part funded by the racing industry and therefore they (members) are given strict orders to not say anything negative about the industry. The industry uses the threat of not turning any dogs over to that group if they do. 1) Greyhound racing is a humane, fun and harmless sport. 2) Racing greyhounds are prized athletes that receive the best of care. We treat our greyhounds better than most people treat their pets. 3) Cases of abuse and killing of racing greyhounds are rare isolated incidents. 4) Critics of the dog racing industry are wacko animal rights extremists who are opposed to the use of animals for any purpose. 5) Humane Societies euthanize thousands of unwanted dogs. 6) We would not have to euthanize greyhounds if more people would adopt them. 7) Racing greyhounds would not run if they were not well cared for. 8) Greyhound racing is a highly regulated sport with high standards of animal care. 1) The business of greyhound racing is responsible for the death of thousands upon thousands of greyhounds every year. 2) Greyhound adoption organizations routinely receive racing dogs riddled with external and internal parasites, open sores and untreated broken bones. Many are also covered with scars. 3) Over the last two decades, hundreds of cases of abuse have been documented including greyhounds that were shot, starved, electrocuted and sold for research. Industry insiders report that this is only the tip of the iceberg. 4) This statement is merely a public relations ploy designed to marginalize industry critics. The killing and abuse of greyhounds is a mainstream issue that has been taken to heart by the American public. Opposition to industry practices has been publicly stated in newspaper editorials, by government officials and mainstream animal welfare organizations. 5) Humane Societies do not breed dogs; make money off of them; kill them. Then repeat the cycle. 6) It is not the responsibility of private charities like adoption organizations or the American public to white wash the image of the dog racing industry. 7) Running is instinctual for greyhounds. In fact, it is not uncommon for a greyhound to finish a race in spite of having suffered a serious injury. 8) In most states, dog racing regulations are essentially concerned with gambling rules; breeding and training farm operations are virtually unregulated. Where Do All Those Puppies Go.. Many greyhound puppies and youngsters are judged to be of inferior racing quality at birth or during the farm training process. Many owners elect not to continue investing in dogs that demonstrate little potential of making money; the vast majority of those dogs are destroyed on the farm before they ever start a racing career. In recent years the yearly disappearance of thousands of puppies is explained away by the industry spokesperson as death from “natural causes”. However, this same spokesperson admitted in an interview that puppies were, in fact, destroyed on the farms. Industry insiders confirm that large numbers of pups are destroyed. 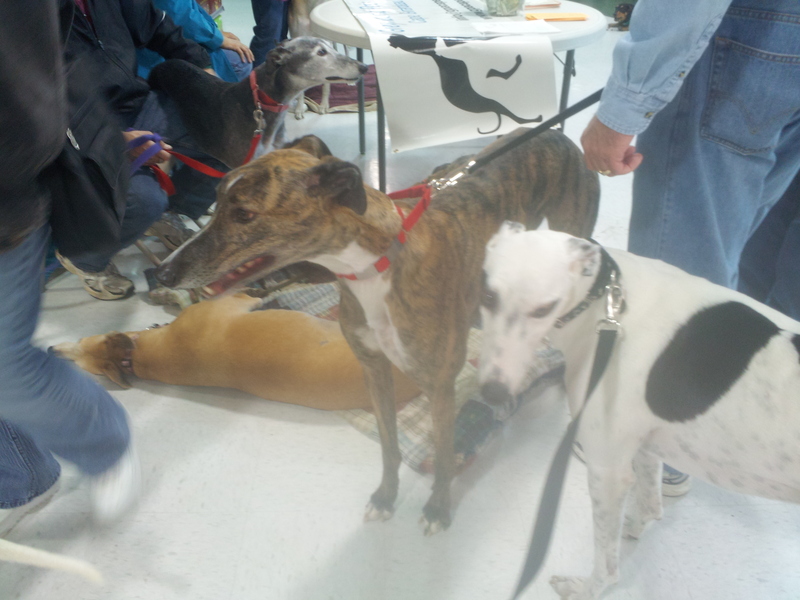 Young greyhounds that do show promise are individually registered and named before going to a track at about 18 months. In the tenth century, King Howel of Wales declared that the penalty for killing a greyhound was the same as that of killing a person, death. In the days of the Egyptians, greyhounds were valued by the pharaohs for their grace, beauty and mild temperament. But in the 21st century, greyhounds in the racing world are prized for only one thing…speed. Every year thousands of greyhounds are killed in various inhumane ways simply because they are not fast enough. It’s an industry that exists solely for the entertainment of humans at the cost of animal lives. Because greyhound racing has little to do with dogs and everything to do with money, scant regard is given to the humane treatment of the greyhounds. This is an industry that places profits above the health and welfare of greyhounds, how else would you explain the culling of unwanted dogs, a general disregard toward animal injury, and the inhumane living conditions that the majority of the dogs endure? Greyhounds are at a disadvantage even before they are born. Tens of thousands of greyhounds are bred annually, many more than are needed to race, in an attempt to create the fastest dogs. The greyhounds are then “weeded out “killed” if they are at any time determined unable to become racetrack stars. Throughout their racing career, the dogs routinely endure inhumane conditions and have little human contact. Many greyhound farms are barely getting by financially, so the dogs are kept caged most of the time and fed low quality foods. Each dog is a major expense, which is why so many are killed in various, inhumane, ways when they are deemed unfit to race. Please consider adopting a greyhound. So many are waiting for someone like you and me to save their lives. And if adoption is not an option for you right now, they are always in need of people who are willing to foster. In fact, there are many ways you can help, so please do. Join the fight to stop the racing and subsequent killing of these precious greyhounds. The Greyhound is a unique animal. They draw crowds and are the center of attention wherever you take them. Greyhounds generally are not barkers, (which is beneficial in suburban and apartment environments,) and they are usually as friendly to strangers as they are with their own family. 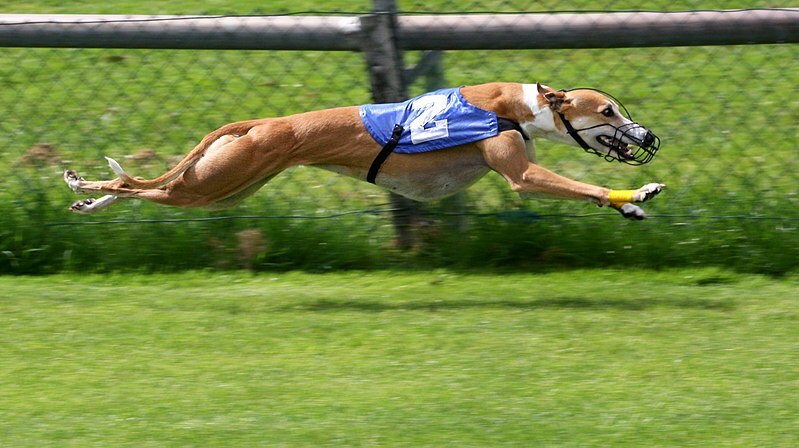 The key to the speed of a Greyhound can be found in its light but muscular build, largest heart, and highest percentage of fast-twitch muscle of any breed, the double suspension gallop and the extreme flexibility of the spine. “Double suspension rotary gallop” describes the fastest running gait of the Greyhound in which all four feet are free from the ground in two phases, contracted and extended, during each full stride. In ancient times, to be presented with a Greyhound was considered the most prized gift one could receive. Persians believed that the Greyhound was permitted in the next world to give information and evidence about mankind. It was the Egyptians who first raced Greyhounds for sport in open fields with the wild hare as quarry and no rules of the game except speed. In the Early Kingdom, Greyhounds were considered to possess divine powers. 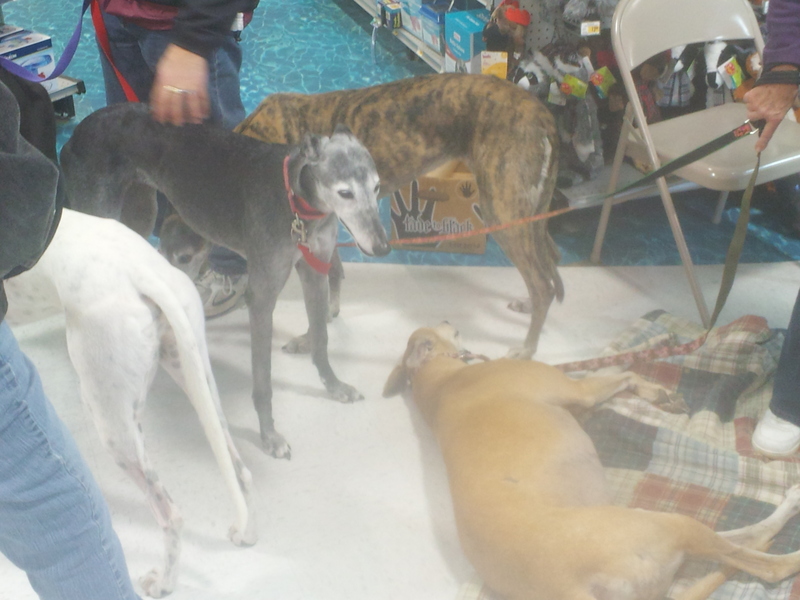 A very common misconception regarding Greyhounds is that they are hyperactive. In retired racing Greyhounds, this is usually not the case Greyhounds can live comfortably as apartment dogs, as they do not require much space and sleep close to 18 hours per day. In fact, due to their calm temperament and the amount of time they spend sleeping, Greyhounds actually make better “apartment dogs” than smaller, more active breeds. The Greyhound is an ancient as the desert from which it sprung. For thousands of years they were the dog of choice by kings, queens, pharaohs, sheiks, and people of distinction. In early Arabian culture, the birth of a Greyhound was cause of great celebrations and second only in importance to the birth of a son. They were the only dogs permitted to share an Arab’s tent or ride atop his camel. They were also the only dog mentioned by name in the King James Version of the Bible. Even though Greyhounds are large dogs, they can curl up in a remarkable small space. Some famous Greyhound fanciers were Cleopatra (the first lady of the Greyhound), Queen Elizabeth I, George Washington, Teddy Roosevelt, and General George Custer. 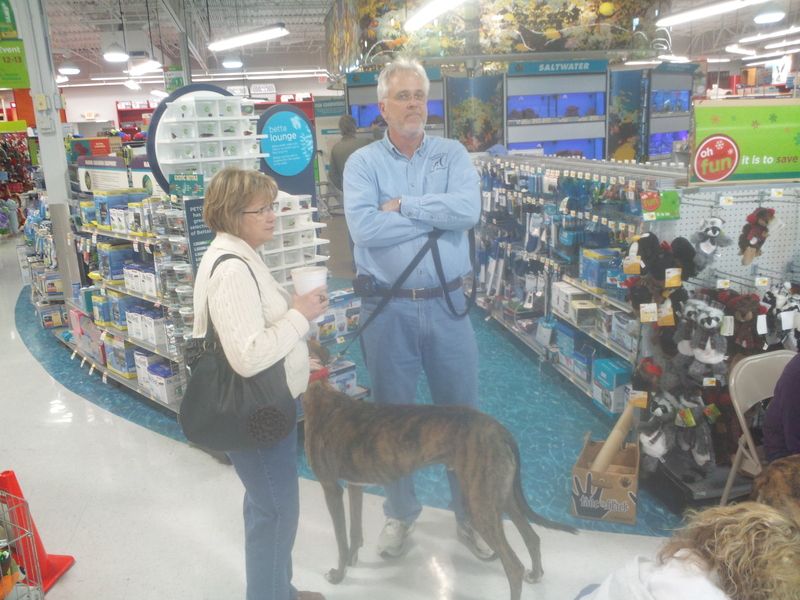 Greyhounds are typically a healthy and long-lived breed, and hereditary illness is rare. Some Greyhounds have been known to develop esophageal achalasia, bloat (gastric torsion), and osteosarcoma. Because the Greyhound’s lean physique makes it ill-suited to sleeping on hard surfaces, owners of companion Greyhounds generally provide soft bedding; without bedding, Greyhounds are prone to develop painful skin sores. Due to the unique physiology and anatomy of Greyhounds, a veterinarian who understands the issues relevant to the breed is generally needed when the dogs need treatment, particularly when anaesthesia is required. Greyhounds cannot metabolize barbiturate-based anesthesia as other breeds can because they have lower amounts of oxidative enzymes in their livers. Greyhounds demonstrate unusual blood chemistry, which can be misread by veterinarians not familiar with the breed; this can result in an incorrect diagnosis. Greyhounds have higher levels of red blood cells than other breeds. Since red blood cells carry oxygen to the muscles, this higher level allows the hound to move larger quantities of oxygen faster from the lungs to the muscles. Greyhounds have lower levels of platelets than other breeds. 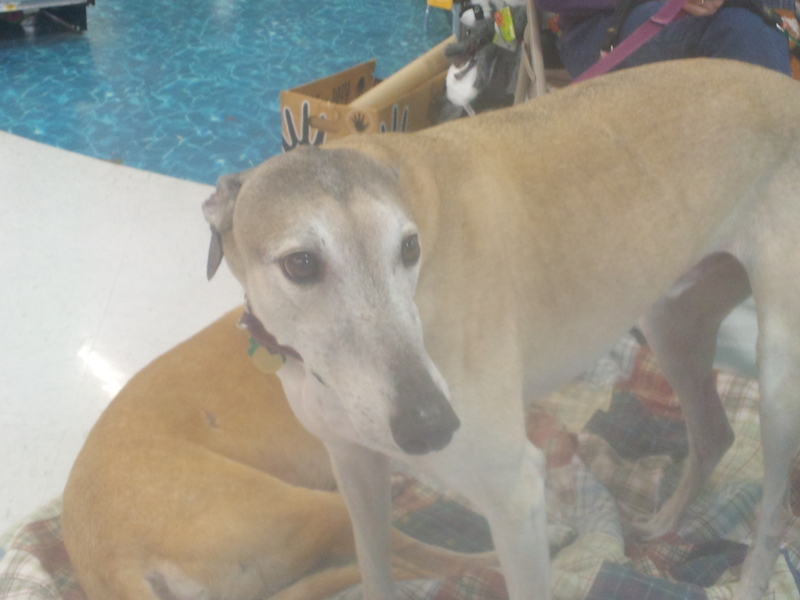 Veterinary blood services often use Greyhounds as universal blood donors. Greyhounds do not have undercoats and thus are less likely to trigger people’s dog allergies (they are sometimes incorrectly referred to as “hypoallergenic”). The lack of an undercoat, coupled with a general lack of body fat, also makes Greyhounds more susceptible to extreme temperatures; because of this, they must be housed inside. These fleet-footed dogs are sight hounds. They can spot a moving object up to half a mile away. Their sprinting ability enables them to expend an enormous amount of energy in a short amount of time. They run at their fastest between 40 and 45 mph, making them the second fastest accelerating land animal on Earth, only behind the Cheetah. They can achieve that speed within their first three strides. Their ability to blend speed, coordination and strategy has made them great hunters. Like a forest of trees, Greyhounds are one of the earth’s valued treasures. They are extremely clean and do not have the “doggie odor” of other breeds. Genetically, in terms of hereditary health problems, they have few. They give, want, and need an unlimited amount of love, as they are very sensitive dogs. They are kennel broken, thus in most cases they house break easily. They are clean, easy to care for, and gentle. They love and enjoy children and seniors, a wonderful companion and house pet for the entire family. They are entertaining and amusing. They are young ( usually between 18 months and four years), healthy, lead trained, and instantly bond to their new family. Their life expectancy is between 12 and 14 years on average. They don’t need any more exercise then other breed. A daily walk or a romp in a fenced yard will do. They also make excellent jogging companions. They are very social and can learn to live with other pets (including cats) in your family. They come in many colors and stand between 26 and 29 inches tall at the shoulder and weigh between 55 and 85 pounds. 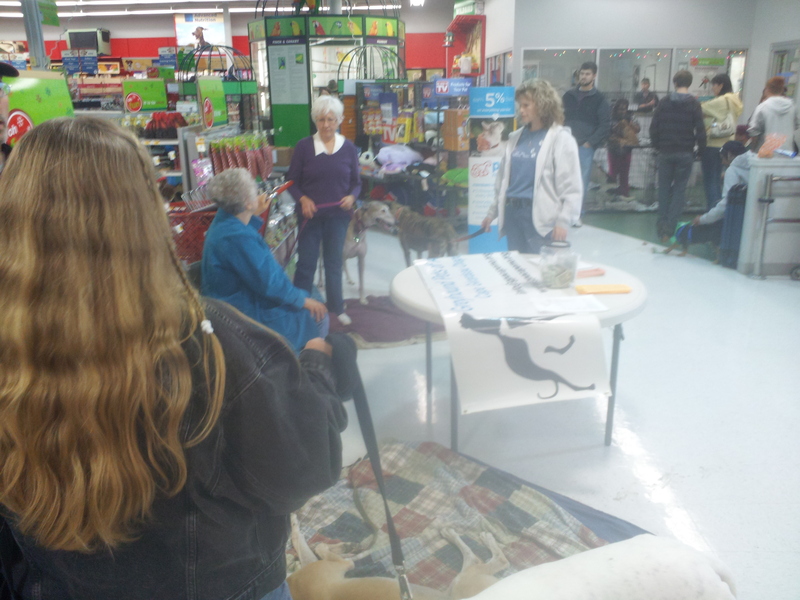 They are examined, spayed/neutered, vaccinated, checked for heart worms, teeth cleaned, wormed, and groomed before adoption. 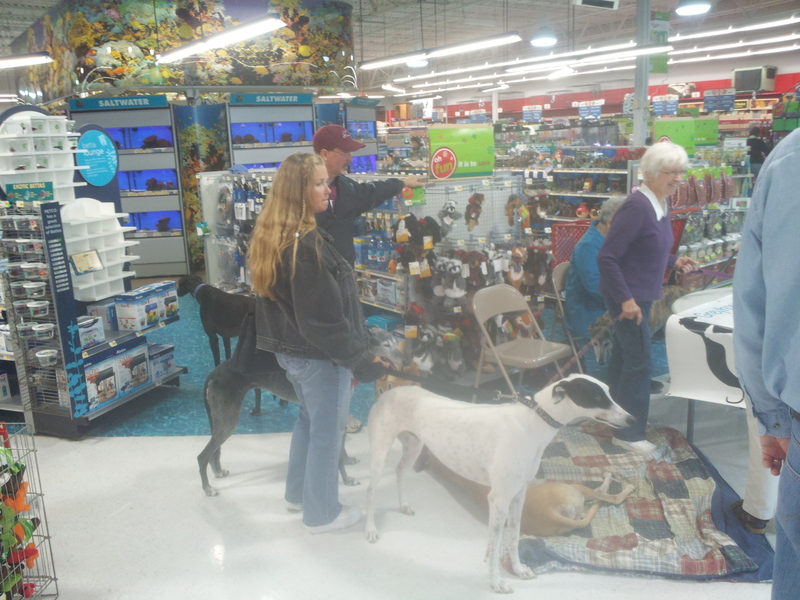 I want to thank Petco for supporting the cause of pet adoption and rescue, not just greyhounds, but other dogs and animals also. 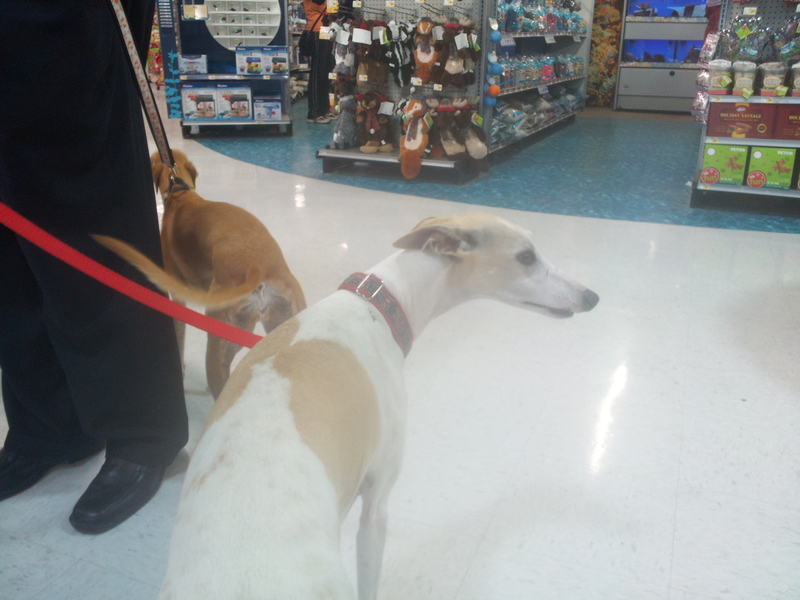 Two Whippets who came and visited with their larger greyhound cousins! Greyhounds are quite different from other dogs, and have some of the characteristics of the cat. This comes from their powerful prey drive, although if your greyhound was rejected for not having the instinct to chase the lure, chances are he may be cat friendly and not too interested in chasing things. 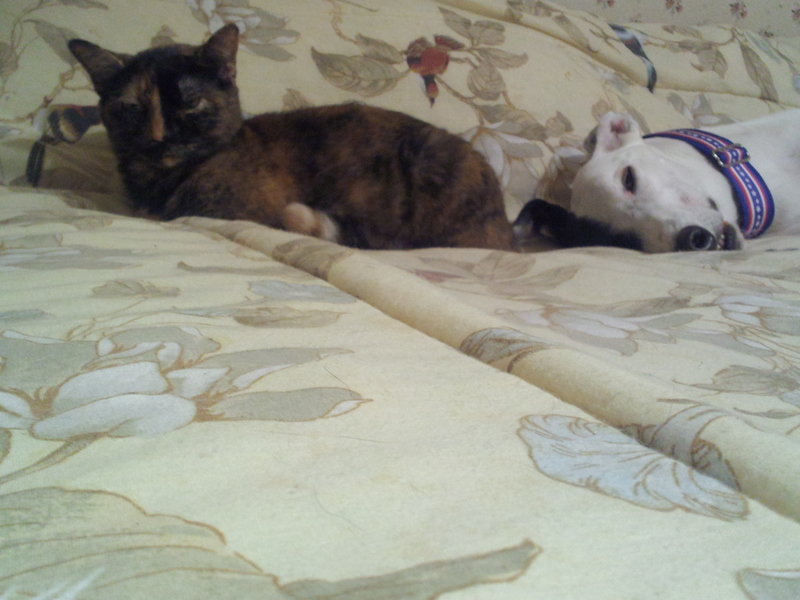 Our two greyhound boys get along with cats just fine and we have 5 cats, 3 inside and 2 outside. 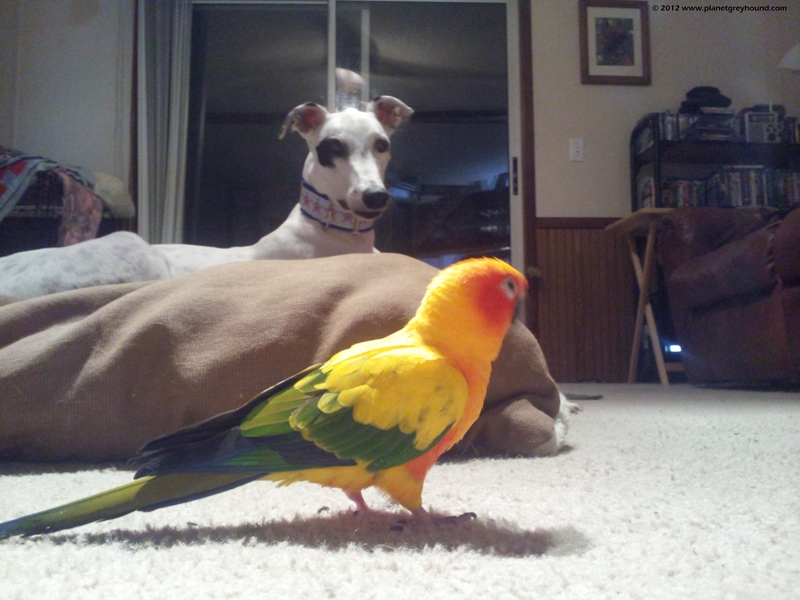 A greyhounds distance vision is phenomenal, and they will stare intently into the distance in the same way a cat does. Most often it’s in your home where the pet Greyhound comes into its own, in this setting they can easily act the clown, which is so endearing! When they are new to living in a house, greyhounds can be easily spooked by things such as a vacuum cleaner, or a loud television. Having been penned up and institutionalized for months or years, in their new home they often go into a second puppyhood, playing, collecting toys, bones or anything that takes their fancy, and surrounding themselves with these fabulous new things! Like any dog, it is vital you keep real valuables out of their reach, and don’t leave food lying about at nose height either. Always treasure these early puppyish moments as they may or may not not last. 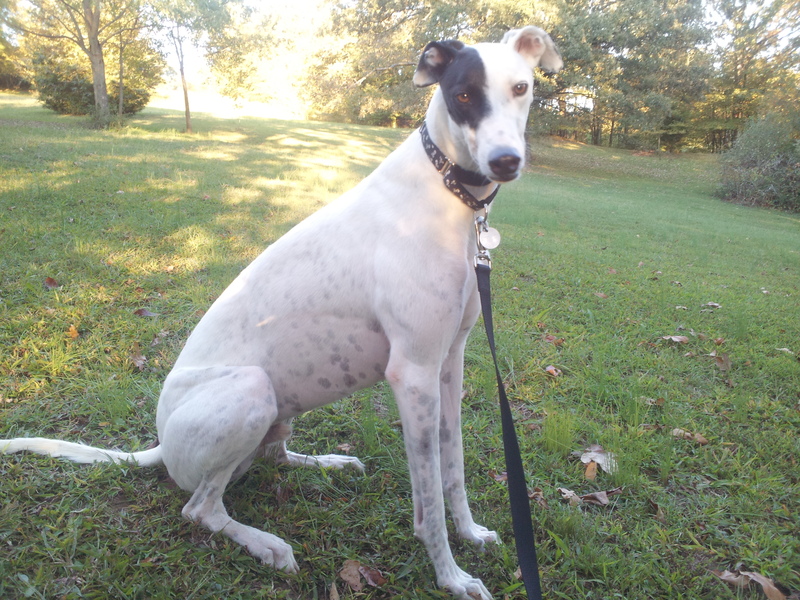 A fit rescue greyhound will have solid, rippling muscles and an elegant, sleek physique. When racing, they are often kept a few pounds underweight, so they will usually show a lot of rib. The pet greyhound usually gains a few pounds, but very rarely will the dog become fat, they seem to self-regulate the amount of food they need. Vladimir & Vitali, our two boys are now 2 years old and every trip to the dog park people are amazed at their musculature, they never fail to get lots of attention. If you adopt an ex-racer, you may be a little surprised the first six months or so. Many are traumatized when they find their “forever home” and just can’t believe their luck! Typically, the new dog is nervous and frightened by your desire to give him a hug as it seems unnatural to him, he may look for an escape route. Some people unintentionally pass on false information detailing the greyhound as a “frightened of their own shadow” type dog, and to some extent, it may appear so… but the abuse that some of them have gone through is unimaginable for us pet greyhound owners and their bravery and resilience in the face of such horrible treatment is truly humbling. There are actually so many physiological differences between Greyhounds and other breeds of dog, they may as well be regarded as a totally different species. Among some of these differences are bigger hearts, their red blood corpuscles more numerous, all commensurate with the highly-tuned sprint athletes they are. 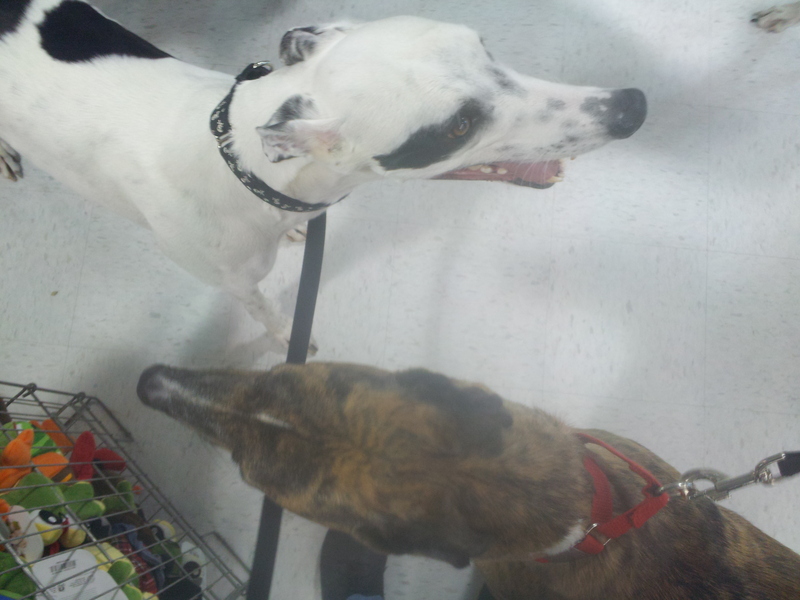 Most people who’ve had a Greyhound say they’d never change breeds. There’s just something inherently magical about the dignity and warm personality of the Greyhound that sets it apart from all other breeds.